AOYAMA Satoru Exhibition "The Man-Machine(Reprise)"
Mizuma Art Gallery is proud to present “The Man-Machine (Reprise)” by AOYAMA Satoru from August 29, 2012. Aoyama keeps on producing artworks with his industrial sewing-machine tackling the issues of “labor” and the “human-machine relationship”. In recent years, he presented a series of his own works confronted to his grandfather’s―a painter himself (Gallery AlphaM, 2010), and also challenged the symbolic yet imperishable motif of the rose in another series (Mizuma Art Gallery, 2011). He continuously re-acknowledges the purpose of embroidery, ceaselessly expanding the spectrum of his activities. In this show he exhibits full color embroidery reproductions of cutouts, both front and rear sides, from news magazines dealing with politics and the social situation. 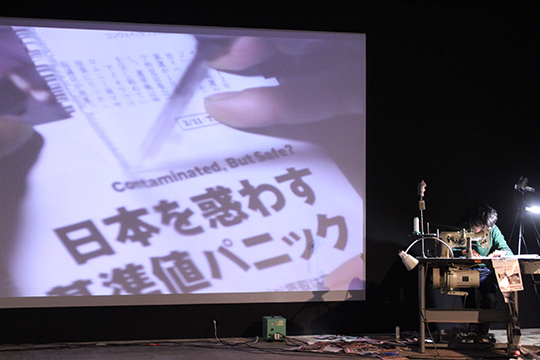 It also includes a projection of the first day live performance with HIRAISHI Hirokazu. 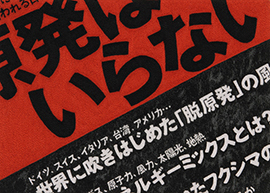 The news articles are selected arbitrarily, and even if they appear as random combinations, the two sides of the cutouts can also be interpreted as hailing each other. 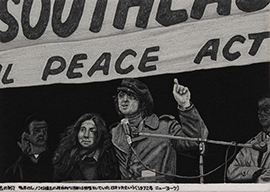 For example, a photo of John Lennon with his strong image of peace activist accompanying an article about his actual conservatism, shows on its back the title of an article saying “No Need for Nuclear Power.” To the artist, the painstaking operation of completing each image one stitch at a time becomes the opportunity to pay attention to the events we overlooked in our daily lives. In the Age of technological progress and acceleration of the transmission speed of information, what does Aoyama’s continuous use of a sewing-machine from the previous industrial age means to us? What is left unchanged when the information transmuted by the media itself transforms and weathers? The exhibition title is based on Kraftwerk’s 1978 album “The Man-Machine”. Translated to “Ningen Kaitai” (= Human Dissection) in Japanese, it nowadays would rather sound like “Return to Humanity”. How does the relation between machines and human will evolve and head to? And in this world of diverse opinions over flooded by information, what will we as individuals opt for? What society will we be able to build? Aoyama wishes this exhibition to be a modest salting point for such discussions.